Trying to capture the essence of Ernest Hemingway is a daunting task, though the inimitable elemental style of the literary icon has spurred many attempts, including the annual International Imitation Hemingway Contest (also known as "The Bad Hemingway Contest"), which lasted from 1977 through 2005. Such attempts to poke fun would not have been greeted kindly by Hemingway, who once said, "The step up from writing parodies is writing on the wall above the urinal." Though writing a comedy about a journalist—Victor (John Arp)—who is infatuated with Hemingway, playwright Michael Hollinger avoids the trap of parody; instead, Victor quotes liberally from the famous writer, borrowing lean, descriptive passages to color his own circumstances, reminding us of why Hemingway's prose is so revered. Arp is dazzling in this effort, making the most of a multitude of narrative opportunities that provide insight to Victor's complex emotional nature: one moment, Arp delivers a send up from film noir; then, he waxes nostalgic over his muse, the elusive Madmoiselle Louise (a demure and alluring Theresa Dwyer Reid). In a fleeting gesture, when Victor recounts a chance meeting with Hemingway during which the nobel laureate cracks a smile, Arp lights up the memory with a dead-on imitation of that terse grin, which seems to fly out of the pages of a nearly forgotten volume of Life magazine. Claude berates Mimi over the smallest variances from his five-star ideal, and shorts her on the romantic and conjugal side, which she endures to a point. Gaston, whose passion for serving up delicacies is exceeded only by his talent for creating them, is also held back by Claude on a couple of accounts. Antoine, the staff newcomer and journalism student by day, feels the sting from Claude as well, while trying to overcome a speech impediment. Delightful and inventive performances all the way around. Director Rebecca Remaly keeps the gags flowing as the staff deals with the most difficult order that Victor has ever put before them: to prevent him from starving himself to death over a series of life disappointments capped off by a split with Madmoiselle. As Victor recounts his story, we are presented with series of existential questions much like those with which Hemingway wrestled. The ironic ending, more O. Henry than Hemingway, nevertheless tests Victor's valor and lust for life. The old man would have appreciated the result. 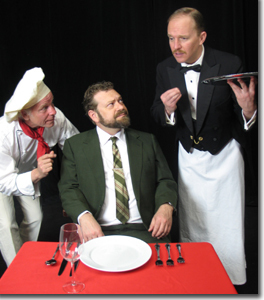 Boulder Ensemble Theatre's production of An Empty Plate in the Café du Grand Boeuf runs through May 7th. 303-444-7328 or www.the dairy.org. 1 The title of Hemingway's post-mortem published, questionably edited biography, A Moveable Feast, was suggested by Hemingway's friend A.E. Hotchner, author of the biography, Papa Hemingway. In a conversation about the City of Light during Hotchner's first visit there, he told the author, "If you are lucky enough to have lived in Paris as a young man, then wherever you go for the rest of your life, it stays with you, for Paris is a moveable feast."